WATCH how Adil Rashid bowled Virat Kohli with a stunning delivery in the third England v India ODI Last Updated: 17/07/18 3:29pm 0:25 India captain Virat Kohli was left completely dumbfounded by Adil Rashid after the spinner deceived him with a sensational delivery in the third ODI. Adil Rashid produced an absolute crackerjack delivery to remove Virat Kohli in the third ODI at Headingley – one reminiscent of the Ball of the Century Shane Warne bowled to Mike Gatting in 1993. A visibly stunned Kohli could not quite believe his misfortune as his hopes of a 36th ODI hundred went begging – Rashid celebrating with the wicket of Suresh Raina later in the same over. 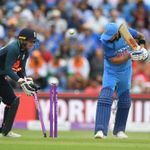 Watch Rashid’s brilliant dismissal of Kohli in the video at the top of the page – and catch continued live coverage of the third and final ODI in Leeds on Sky Sports Cricket and Main Event.